Once on top we easily found the trail down. 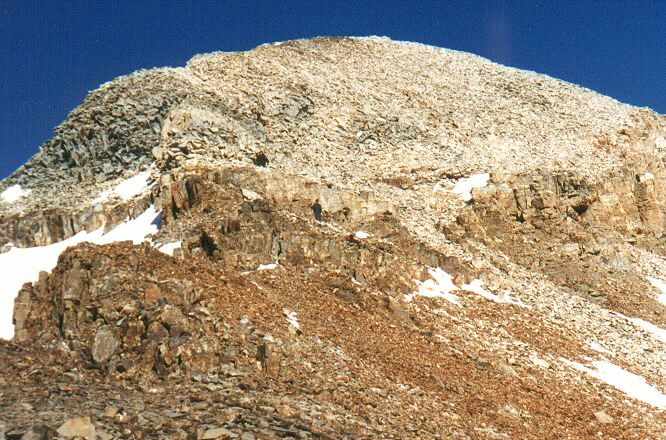 Three climbers are visible in this photo. Samten. having injured his leg, stayed at base camp. All in all, it was a good trip; we had summited on Truchas, the second tallest peak in New Mexico, a few days previous. Unfortunately, this was the last time I was to be in the mountains with Kirk. On the way home, we stopped in Albuquerque to get Sangye Dorje's blessing and then hit a late night tortilla place. Samten and Kirk swapped the steering wheel over the next twenty hours and I have not seen Kirk since. Like so many brilliant young men capable of ascending to great heights, Kirk was seduced and devoured by the demon Ramakrishna called Kamini-kanchan.